VW wants to be big pickup player, but maybe not in U.S.
VW is considering giving U.S. dealers the Amarok. LOS ANGELES -- Volkswagen wants to become a dominant player in pickups -- but not necessarily in the United States. VW is considering giving U.S. dealers the Amarok, a 2.0-liter compact pickup developed through VW's Commercial Vehicles division, said Stefan Jacoby, CEO of Volkswagen Group of America. In January, Volkswagen AG will begin global marketing for the Amarok, which it will build in Argentina and sell in South America and other markets around the world. 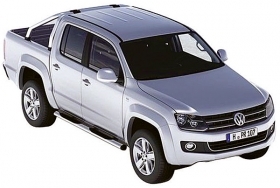 VW already is heralding the Amarok online by calling it a pickup "that aims to conquer the international market." But the automaker isn't sure the truck is ready to tangle with the U.S. pickup market, Jacoby emphasized. "It's a compact pickup, and they're very price-competitive," he said during this month's Los Angeles Auto Show. "A lot of our competitors have burned their fingers in this segment." The Amarok's price would have to include the so-called chicken tax, the 25 percent tariff the U.S. government slaps on imported pickups. VW's effort to sell pickups here in the early 1960s was largely what prompted the administration of President Lyndon Johnson to push for the chicken tax in the first place. Jacoby also worries that his dealer network is not geographically aligned with the U.S. pickup market. "We don't even have our dealers in the markets where pickups are sold," he said. Despite all that, Jacoby said, selling the Amarok here is "on the table."